Editing supplied CD-R or DDP is an extra-cost service needing mastering & proofing. Supply final 16 bit 44.1 kHz WAV files instead to minimize mastering fees and proofing time. Quantity: 10 25 50 75 100 150 200 250 300 400 500 750 1000 For large quantities look at replication packages. For printed carboard jackets look at this calculator. We also offer CD Pressing (replication) with pro silkscreen and offset printing. Your artwork must be ready to print. Design and layout is available at extra cost. *Note about wrapping: quantities below 500 are often wrapped in a resealable crystal-clear bag. For larger quantities we can use shrinkwrap or overwrap. Audio files must be 16 bit, 44.1 kHz WAV or AIFF for audio CD copies. Mastering services are available if needed. **If you are supplying audio files please pay special attention to the specified space between the songs. If your tracks have been mastered as an album then it is likely that you want the default option "0 pause seamless mix" because your mastering engineer has already set the spaces between the songs. Otherwise you may want a default 2 or 3 seconds between songs if this is just a demo or promo CD. Finding the right pause is part of mastering and is available if you purchase mastering services. Please contact us for all custom quotes. Some special blank media choices may not be in stock and may add to the turntime, but we generally have the biggest stock of any duplicator in Canada. We have many print options available. If you add up all the combinations of discs and print modes you will find there are tens of thousands of possible combinations. Some people want quick single-use promo copies today, and others want a permanent silkscreen and don`t mind waiting 5 more days. Here is a description of the different options. Text and logo is ideal for low cost, fast turnaround, and large volumes. We can do thousands per day. Full-colour graphics mode is ideal for complete graphic coverage where speed and low cost are the main concerns. The print quality is good and you will save money. Heavy ink densities are reduced to allow high-speed production. Photo Best: full-colour printing in slow print mode, allows heavy ink coverage and better resolution. Epson 6 Colour Photo: Super-high-resolution printing reduces the visibility of the ink dots. Great print quality. Gives stunning results with glossy Falcon Smart Guard discs. Thermal printing prints directly onto the plain CD-R surface. This technology is best for printing text and simple logos in 1 color (black, red, blue, or green). The printing area is 38mm to 114mm diameter. Paper labels are not used very often. We recommend to print directly onto the disc instead of applying paper labels. Paper labels tend to peel over time and to cause balance issues in highspeed computer drives. This is how most commercial CDs are printed. Vibrant inks are silkscreened directly onto the disc. The disadvantage of this service is that films and screens must be prepared and the silkscreening will take several days. Your artwork is best prepared in Illustrator or Corel Draw using the Pantone Solid PMS color palette (ex: PMS Red 032, Blue 072 CVC, etc...). 1 and 2 colour silkscreen is a good value for quantities over 250 discs and 5+ day turntime. We can print full-color CMYK images directly onto your CD-Rs, DVD-Rs, or Blu-ray BD-Rs. It is important to understand that the silkscreen process will change the contrast of your image.Silkscreen is best for solid colours, and not photos or gradients. CMYK silkscreen is a good value for quantities over 1000 discs. Offset print is called for where large quantities of discs need to be printed with a photo image. This service is offered on a custom-quote basis, so please contact us for this service. 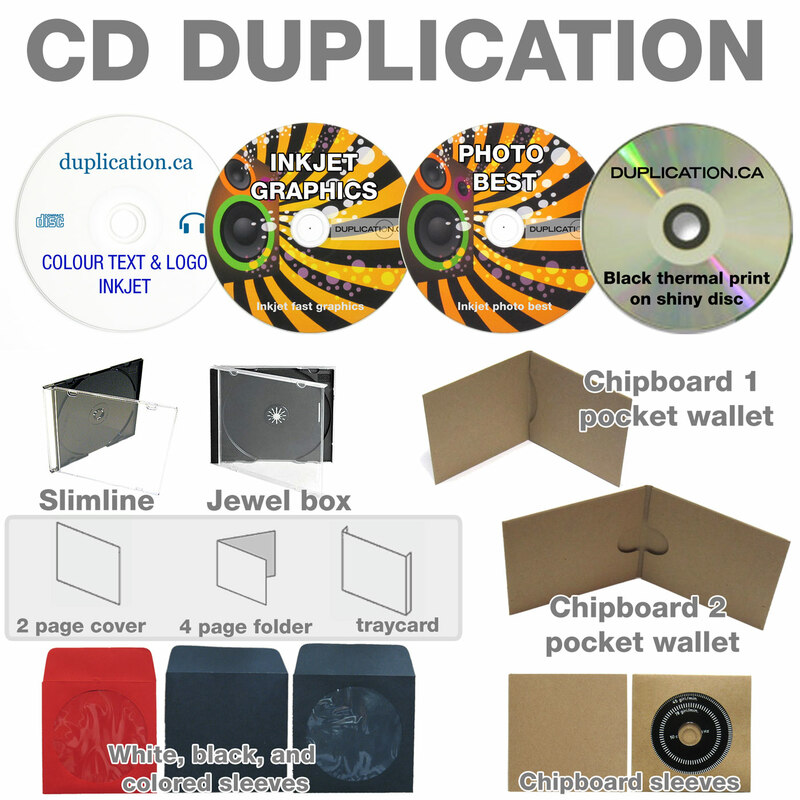 We offer digital printing of your CD and DVD covers. These are covers we print inhouse on our own OCE production machine. We can offer service as fast as same-day. Booklets and larger poster formats require extra time for bindery or offset printing so they are not offered as part of these quick-turn packages. These covers are printed full colour on both sides of the paper. The standard paper stock is 100lb text gloss. This is the piece that goes in the back of the standard CD Jewel Box case. Monday to Friday are counted as business days. Day 0 is the day we have master, approved artwork, and all required licenses in hand before 10:30 AM EST. For same-day turn we may need the parts by 9:00 AM, depending on the quantity ordered. "0 day" turn means same-day service. "1 day" means we would be ready to ship the next day at 4:30 PM. We may be able to do better than the stated turntime - please just ask and we'll try to meet your turntime on rush orders. Send your artwork and payment in advance to avoid delays. Burn your CD-R master in Disc-at-Once mode. Never use drag-and-drop, packet writing, track-at-once, XA, or multiple-session modes. Include a track sheet showing the contents of the disc. Call us in advance at 1-800-777-1927 to advise us if you are sending a rush order - we may have to call in additional help. A credit application must be filled out in advance, and approved by us, if you want terms or if you want to pay by company check.